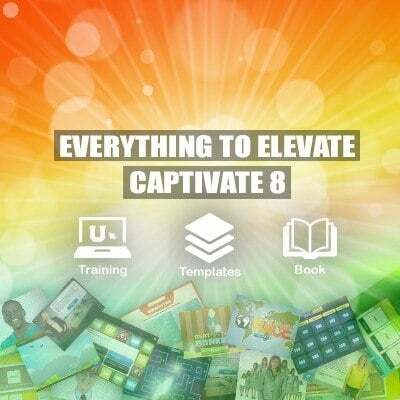 eLearning Brothers, Lodestone, and Artisan E-Learning announce a combined offer of Captivate 8 templates, training, and the only Captivate 8 book available. For eLearning developers, this means access to more than 25,000 assets (including Captivate 8), Captivate 8 Training, and a Captivate 8 Book. the only Captivate 8 book available. “This is the only source on the planet for mobile responsive templates, Captivate 8 training and the first Captivate 8 book. The combination of these three offerings help us fulfill our mission - To make eLearning Rockstars.” said Curtis Morley, President of eLearning Brothers. Lodestone’s Captivate 8 curriculum contains six classes including Adobe Captivate 8: Responsive Design and Adobe Mobile Week with Adobe Edge Animate CC. Lodestone’s CEO Josh “Captain Captivate” Cavalier created a highly interactive training experience for Captivate 8 students with a focus on hands-on activities. Get the latest installment in the E-Learning Uncovered book series! You’ll learn virtually every check box, every menu, and every option in Adobe Captivate 8 for PC plus design tips, power tips, time savers, bright ideas, and cautions. This is the first book released on Adobe Captivate 8 and will be sold exclusively through eLearning Brothers until July 1.
eLearning Brothers provides the planet’s largest, most interactive library of assets for rapid eLearning development. eLearning Brothers was founded in 2009 by two brothers who recognized a need to enable Awesome eLearning development with great looking eLearning templates. Founded in 1998 by Josh Cavalier, Lodestone transfers knowledge of rapid eLearning development tools and education technology. Providing engaging training with a focus on the student experience, their mission is to empower you to create memorable educational content while helping you improve your professional performance. Artisan E-Learning creates custom content using rapid development tools: Captivate, Storyline, Studio, and Lectora. Artisan publishes the popular E-Learning Uncovered book series, featuring books on each of these e-learning authoring tools.